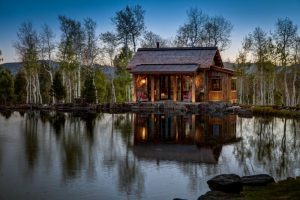 Wood houses are so interesting and offer so many benefits for the homeowners. They are so natural and feel so back-to-earth. Moreover, such houses are custom-able, so they can be designed flexibly in various selections of size and style. 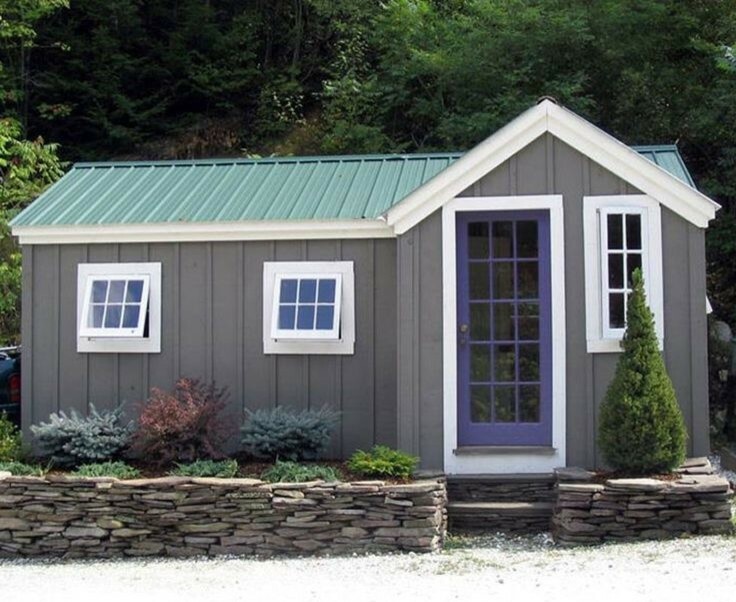 Budget-friendly is another benefit if you choose the buildings with wood. It is a fact that most numbers of wood-made buildings are much more affordable than other kinds of buildings. By contrast, a house made of wood amazingly has much of value, so it’s potential to be so expensive to rent or sell. Well, here we are going to share great choices of simple but unique house made of wood. May be you’ll be inspired then start to re-build your old one into a more newly stylish, unique, and natural house. We’ll display each part of wooden house to describe the details. Please freely to check them out. 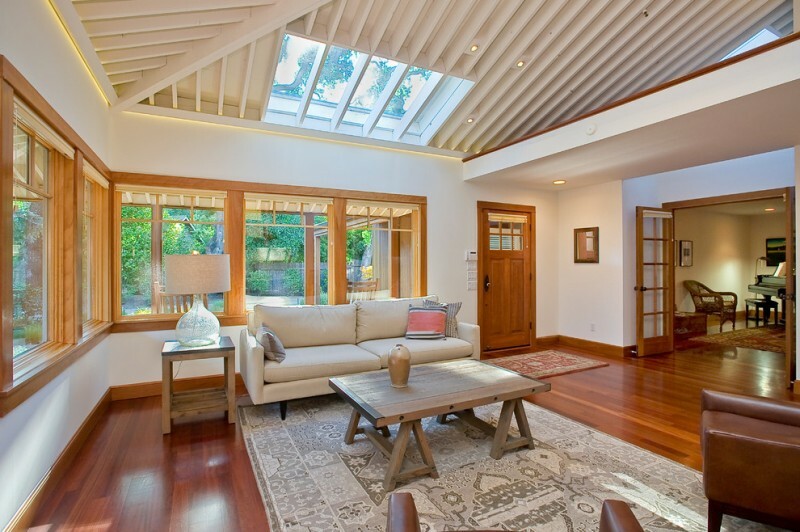 The vaulted-roof model is one of favorite wood house designs because they offer unique and so cottage-looks-like. This kind of building has a typically characteristic: arched-roof design like other common cottage units. 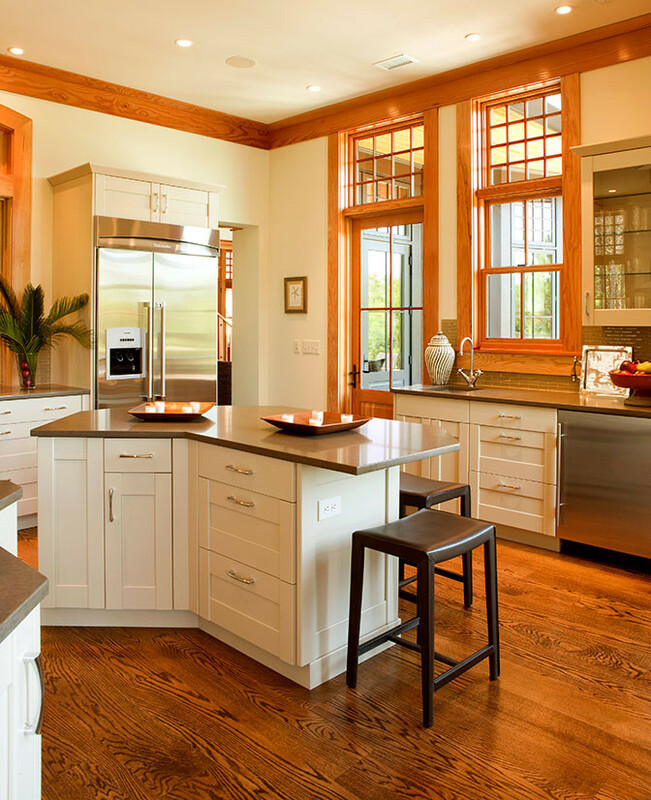 This kitchen describes all kitchen’s elements are in wood finishes, but not the windows, appliances, and classic console table plus its decorative chimney. Just take a look at the dining furniture; they are made of best walnut. Then, white oak covers the floors beautifully. 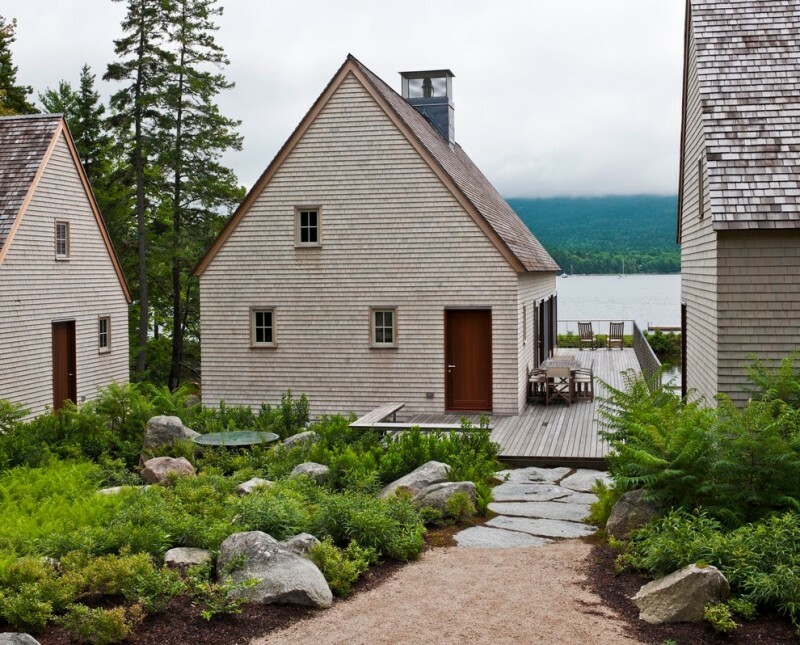 A guess cabin’s exterior is simple yet so stylish, warming, and so inviting. The wall systems are kept in old and shabby but they’re little modern with black wood-framed glass door and windows. 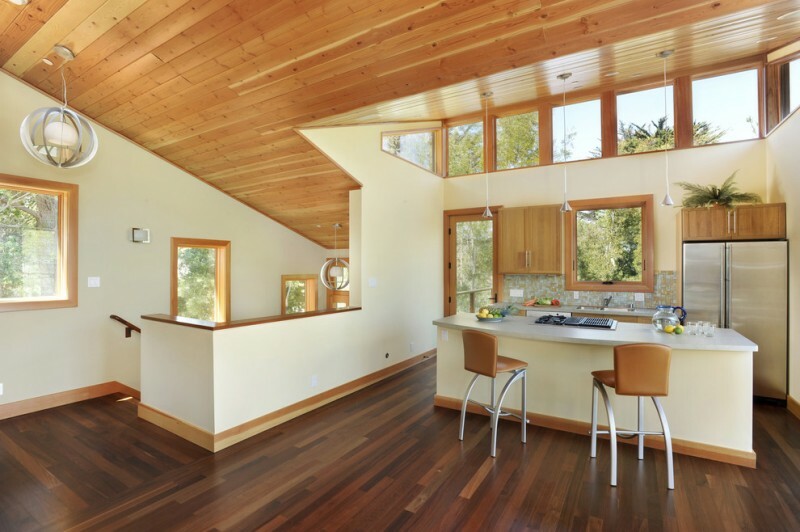 Clean rustic style is also identified from white oak use for floors. 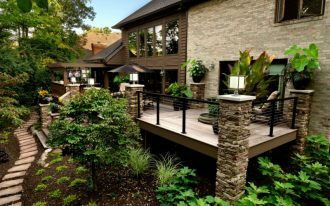 Not only that, the railing system looks so trendy & modern by collaborating it with lightweight metal nets. It’s so stunning and warming. Still about a guess cabin; the living room is filled with just few furniture like a couple of sofa slipcovers, round center table with slipcover, tiny and simple side table, and a tiny wooden chair. They are perfected illuminated by modern rustic pendant lamps. 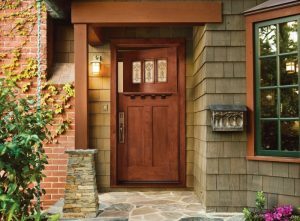 Like the exterior, the interior parts like floors, roofs, door, and windows are built from best wood. It’s so inspiring to put a sitting area and mini storage together in a hallway. It depends what size your hallway is. 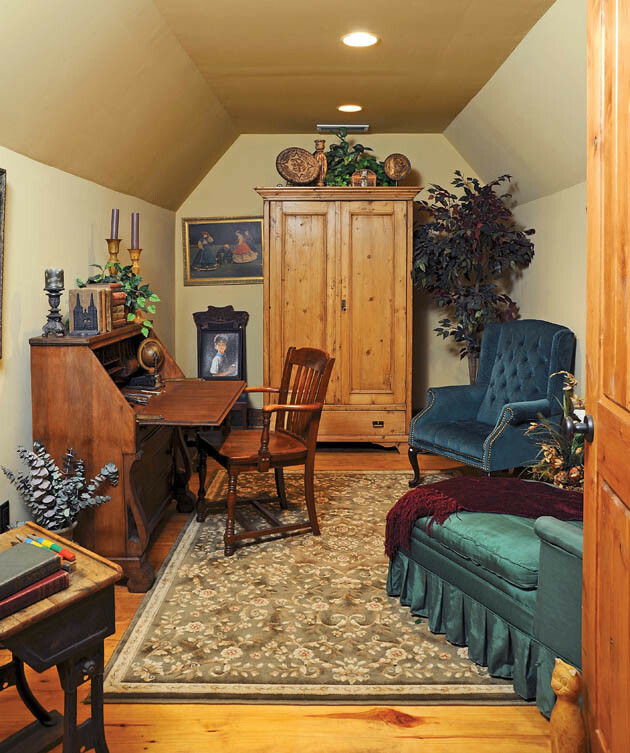 A narrow or tiny hallway is better collaborated with a couple of small chairs. Mini side table, recessed wooden rack, and red carpet with floral motifs are best complementary elements. All you need is here. An open space contains the primary rooms like living room, bathroom, kitchen & dining room, and bedroom on top. Such building is well recommended for a guess house or your teen’s space which is usually built in back garden. That sounds so interesting, right? Tiny but full of function; two words we can say about this home office. The space is not only supported with complete office properties, but it also has other additional furniture like sofa with accent pillow and standing book rack. This means, when this space is free from working, you can use it as a stylish and cozy reading nook. 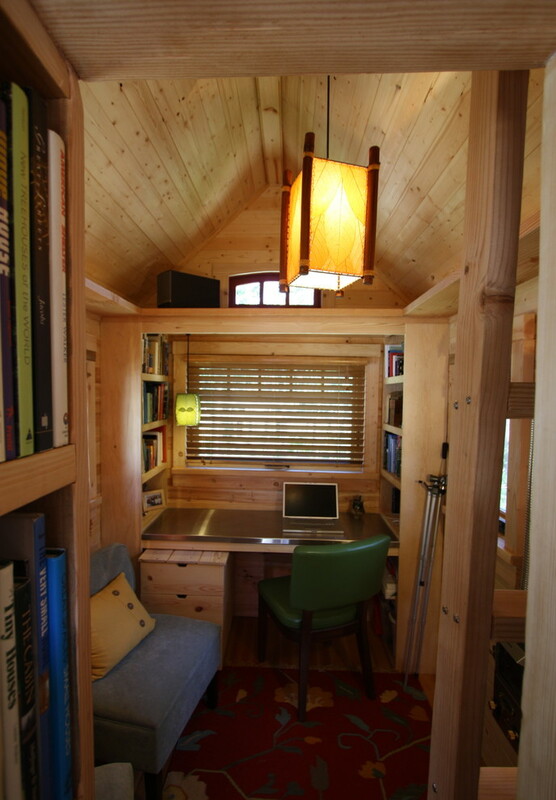 What an amazing if we have a home office as what we dream on. Home office idea above, for instance, the owner loves classic decorations. It’s clearly seen from some decorative items which are classic (for example: wall arts, decorative frame, etc). The furniture, in addition, is also designed in classic look. Well, this one quite suits for you who love a modern home office concept. The homeowner uses no finish to place over the wooden-made furniture, and black-finish (covering the chairs and working leather chair) is selected to create a contrast. 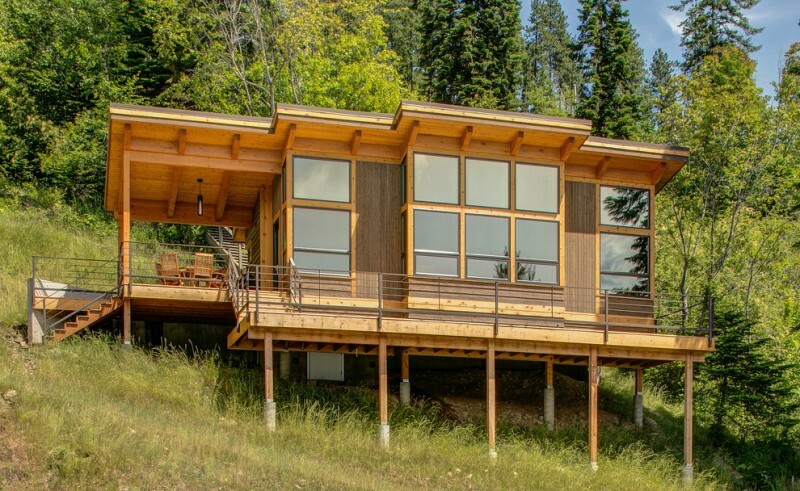 What makes this cabin more attractive and distinctive is its windows. The designer gives the series of mirror glass panel for windows. More interestingly, cabin has been guarded with modern metal railing system along the building. 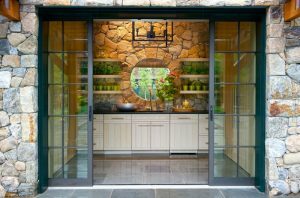 Both mirror glass windows and railing systems are two elements that refer to modern appeal. 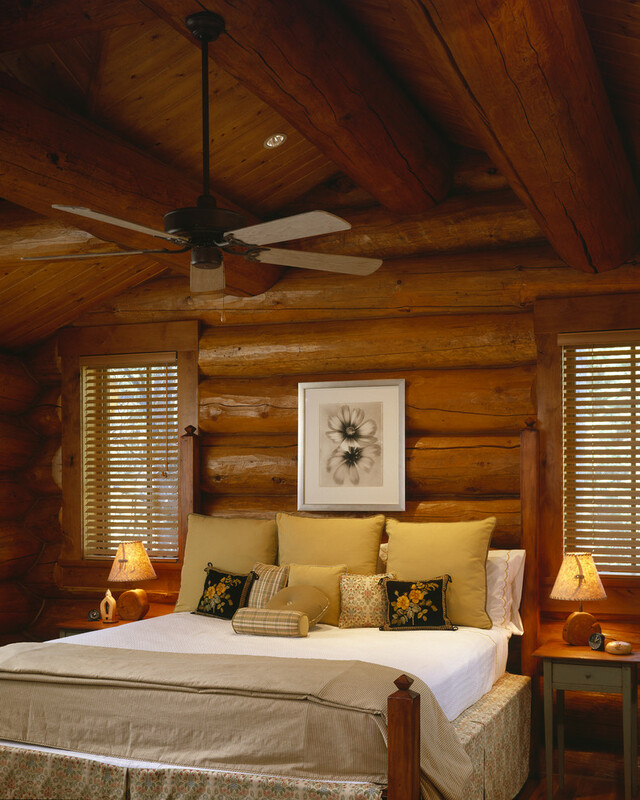 It feels so comfortable if a cabin’s bedroom is provided with simple & modern bed made of best cedar. It works optimally if we pair it off a set of fluffy white duvet and pillows. 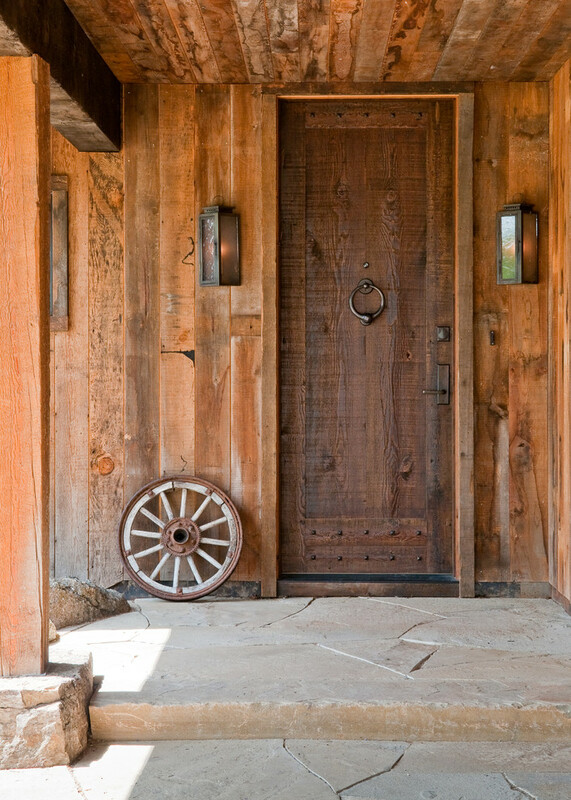 Sliding barn door attractively succeeds to distract everyone staring it at. 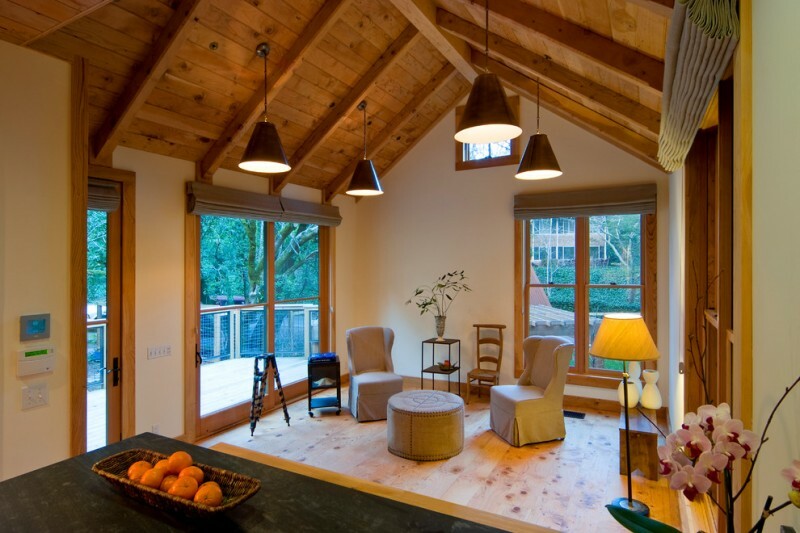 Utilize your cabin or wooden house with such simple and cozy living room. 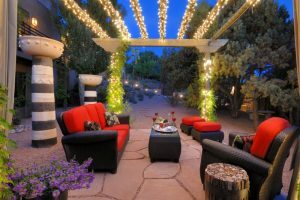 Set single sofa and pair it with other complementary items like black wire-made side tables, wooden coffee table with black base, and balls-shaped pendant lamps sparkling low lighted illumination. The collaboration must be so dramatic. 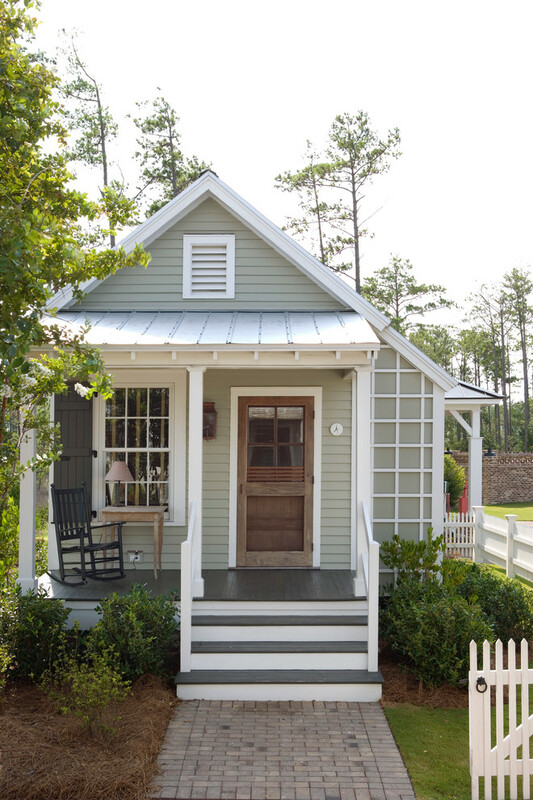 Mini cottage exterior is designed in simple way. As the other common cottage houses, this one has the vaulted roof and it is accented a small white window. The house’s exterior consists of supporting exterior items like stairs, entrance door, and furniture for porch. This photo is a Japanese house which is inspired from a tea house concept in Japan. Amazingly, this building is hand-constructed using wooden hooks, and it is also constructed using species of local wood. The designer also concerns on metaphysical principles when designing and constructing this house. All interior is built from best local wooden and exotic secondary materials like glass and porcelain. Additionally, there are few interior items which use metaphysical principles to construct them. One of the examples is art glass which is attached on windows. They not only expose their artistic design, but they also own special meaning. 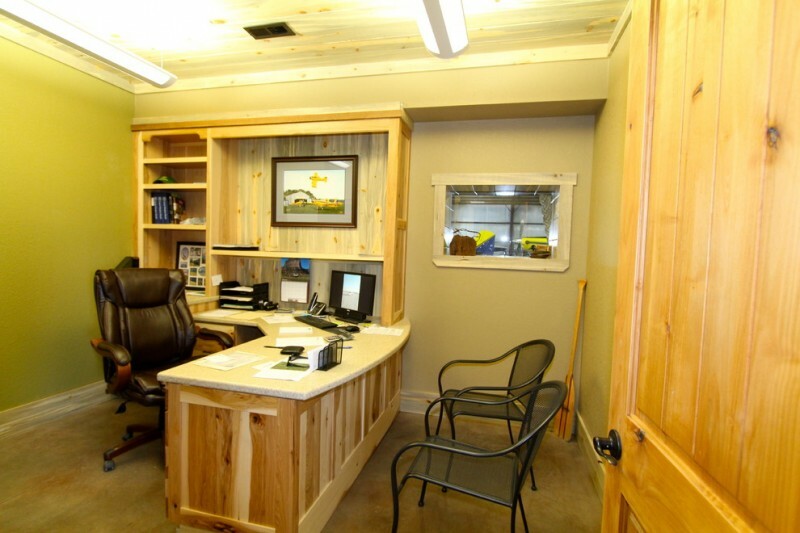 With detailed and careful observation, the wall systems are constructed from best woods. The homeowner covers them with light cream finishing, so they look like the real non-wooden wall systems. This idea is unique and has been applied for some interior parts like kitchen island which is integrated into mini bar. This design is well recommended for a ranch house in which the construction uses exotic and best-quality woods as the main materials. Wooden interior’s facade visibly offers huge of warmth and comfort by the furniture and interior decorating insertions. Medium-sized skylight and the series of glass windows here let the natural lights come into the room optimally, so they provide brightness at day. Feel so warm and cozy, that’s a wonderful nuance created from such family room. The room is designed in large but just few items inserted. A set of modern sofa plus its additional chaise is prepared to accommodate the needs of seating area. 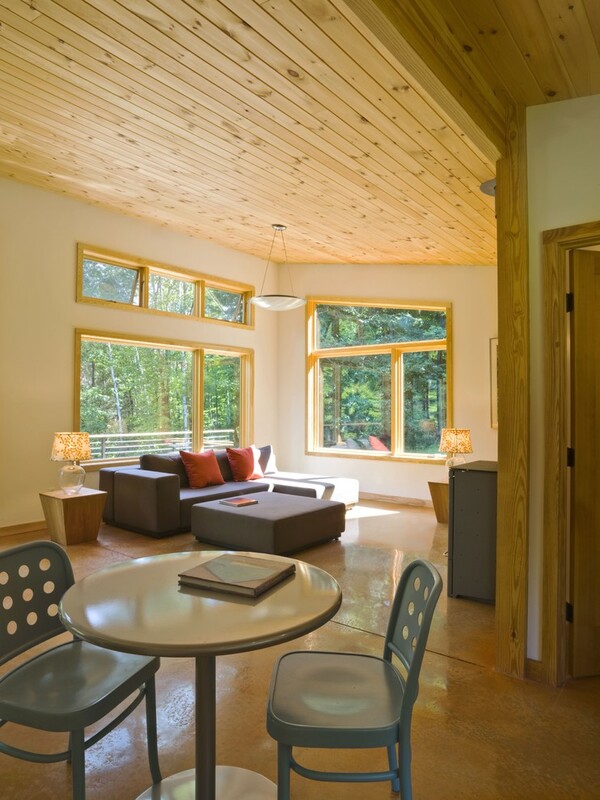 Certain numbers of glass windows are installed to provide sunlight coming from outside. A brilliant idea to adapt this design. Complete your wood-made kitchen with an angled and black bar stools. You can use this spot for having breakfast, gathering, or just welcoming your guess. All interior has medium tone finishes, but not the dining furniture. 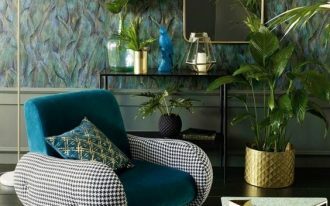 The furniture uses darker tone to create a contrast. Another different item which is also finished with different color accent is a black pendant lamp over the dining table. Both, pendant lamp and dining furniture, intentionally perform the darker tones. 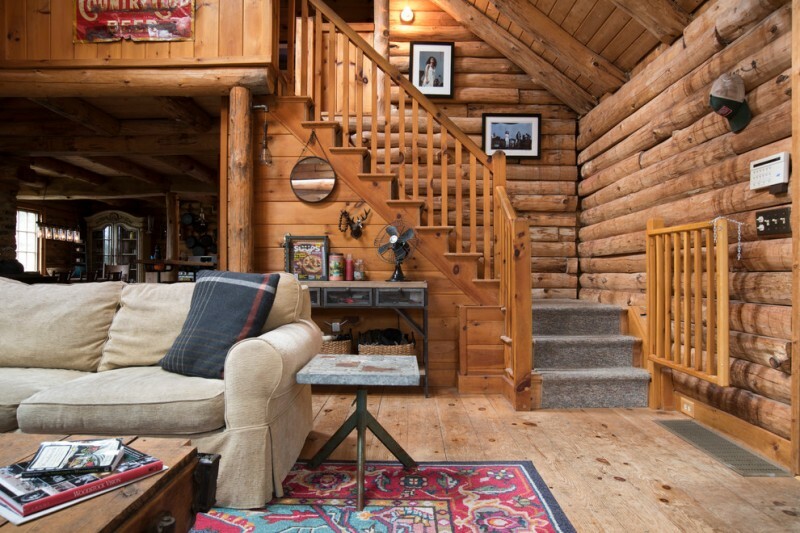 Cabin house is so identical with logs and timbers use. 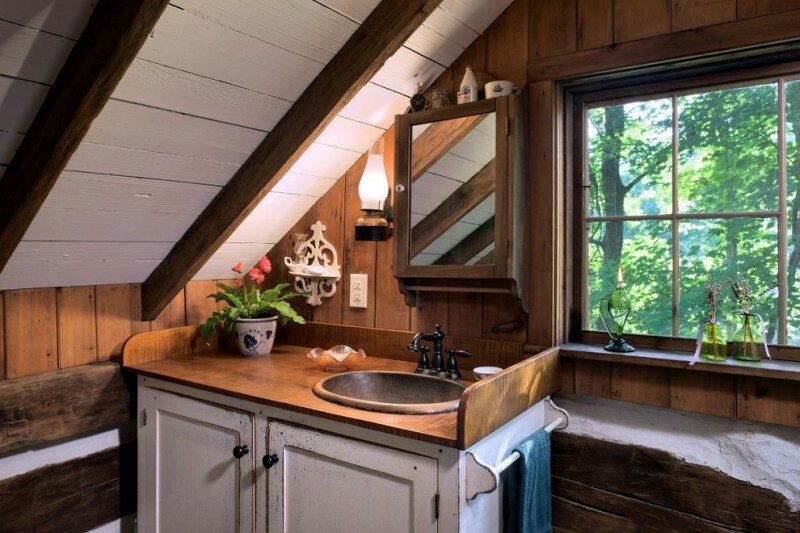 But this one, the owner uses antique logs and timbers for constructing the cabin’s interior. 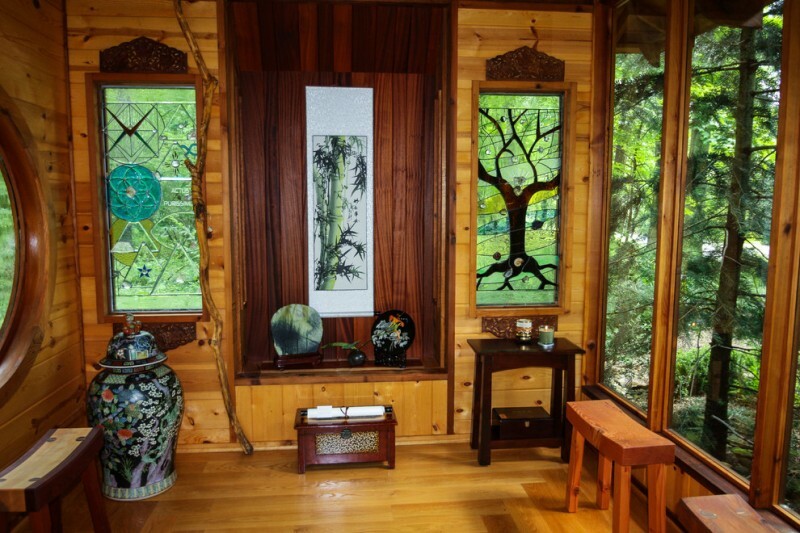 Logs installation, for instance, is obviously displayed on cabin’s walls and base pillars. The staircase is built from antique timbers with wooden hooks to support each staircase’s part. Numerous local logs are also installed to support the cabin’s structure. Something that makes this staircase so attractive is that the owner exhibits the artist’s works on one of staircase’s wall side. So, everyone passes the staircase through, she/ he will be presented a numbers of artistic works like paintings. 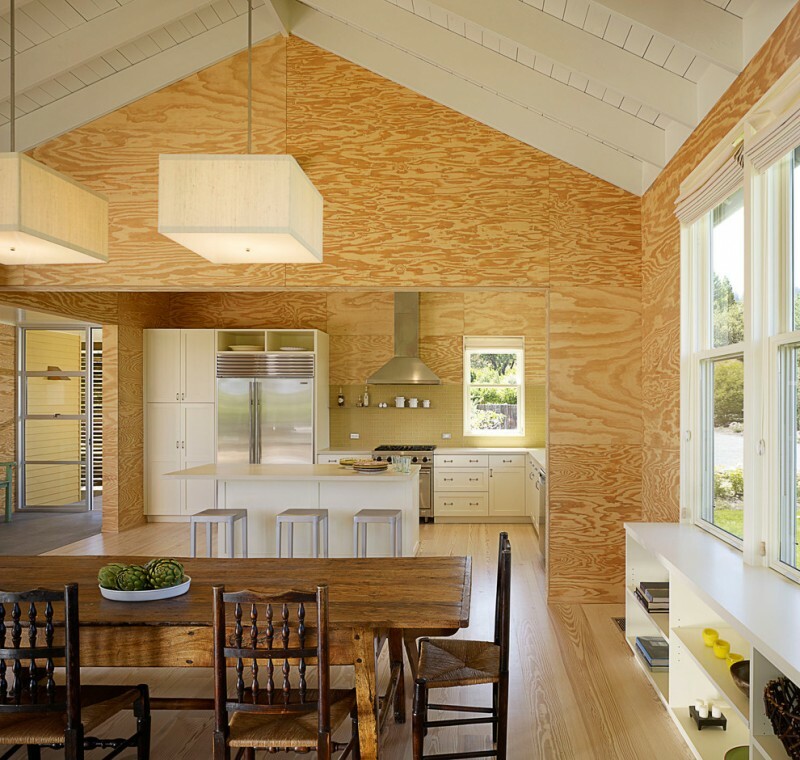 Plywood dominates this room. Just focus on walls and roofs in which they are built from purely plywood. This type of wood is lightweight and firm, so many designers recommend it as one of best wood materials for simple and light houses. 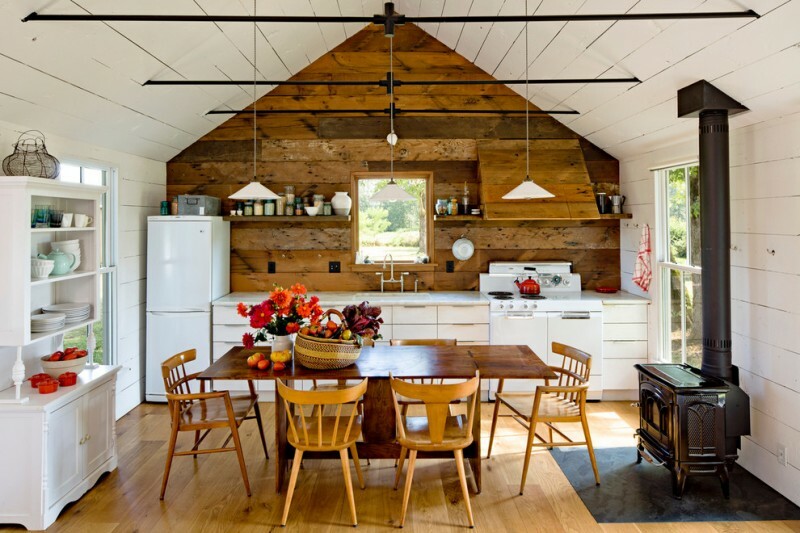 Moreover, the buildings made of plywood are really affordable, so this one is so recommended for you who want to re-build or re-model your kitchen into a friendly-budget kitchen. This design presents warm and simple feelings with minimalist interior. 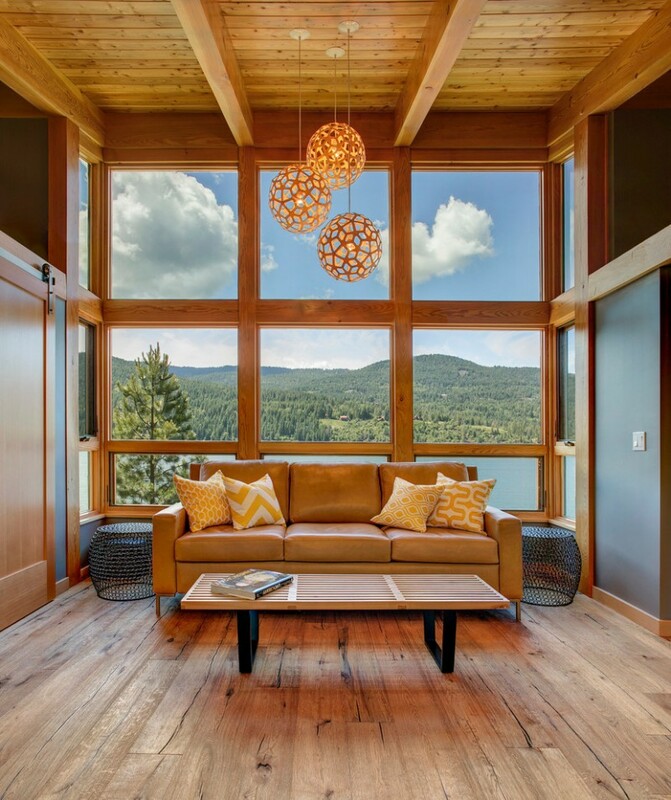 The interior’s simplicity makes us just focusing on spectacular view outside. 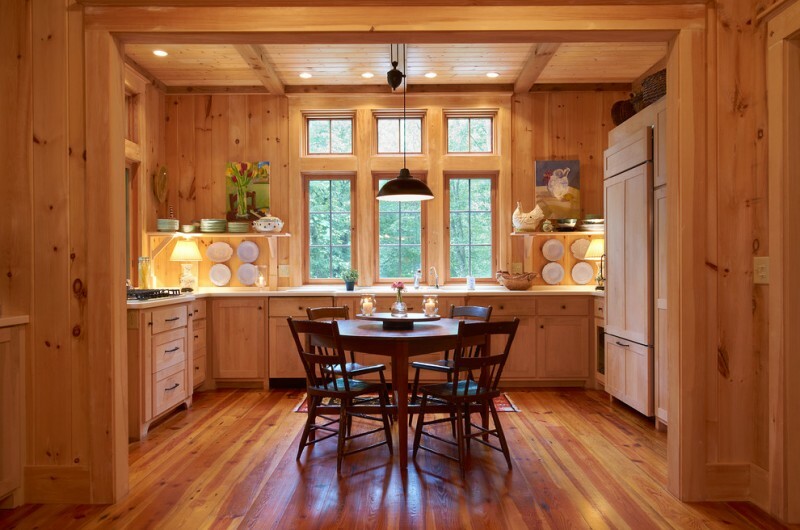 The kitchen is actually built from hardwood floors and white pine which is grained with best plywood. Just simple, put a couple of outdoor chairs plus a small table in your back porch. 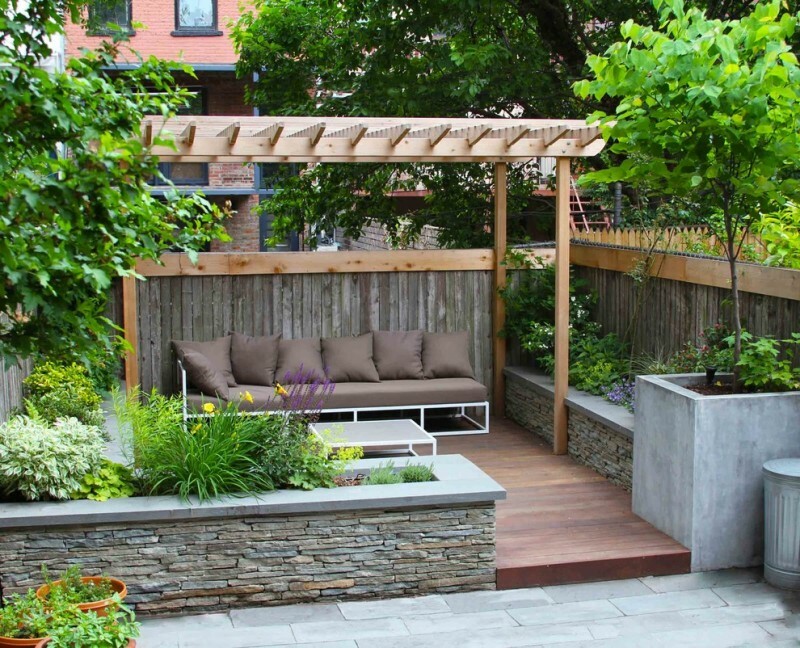 This spot is a perfect for relaxing or just making conversation with neighbors while watching your kids playing around. Different to previous design, this one is designed with much of contemporary accents. The furniture option, for instance, really expresses the most updated trend. The facade displays simple wooden house which is designed with little modern touch. At glance, we can call it as mini modern cottage with modern touch. The construction consists of upper and lower spaces where both are connected by wooden stairs. This is really amazing. 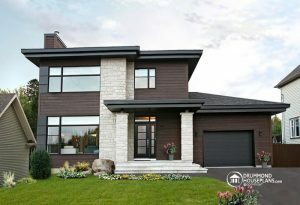 This front facade is very inviting everyone to come in and to enjoy the interior parts. The facade offers spectacular entrance to view like door’s metal frames and transparent glass that cover the house’s main door. Overall, the design looks so minimalist, stylish, and absolutely attractive. 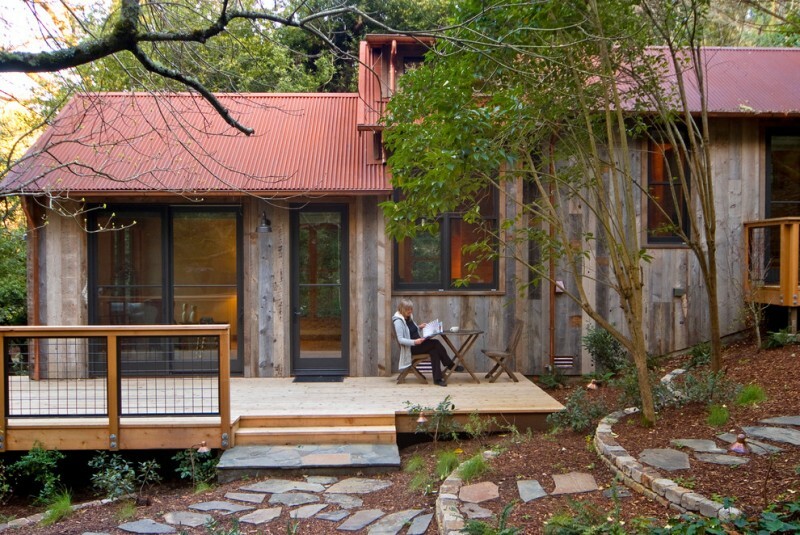 As we know, wood house idea can be applied for any architectural styles, including mid-century. 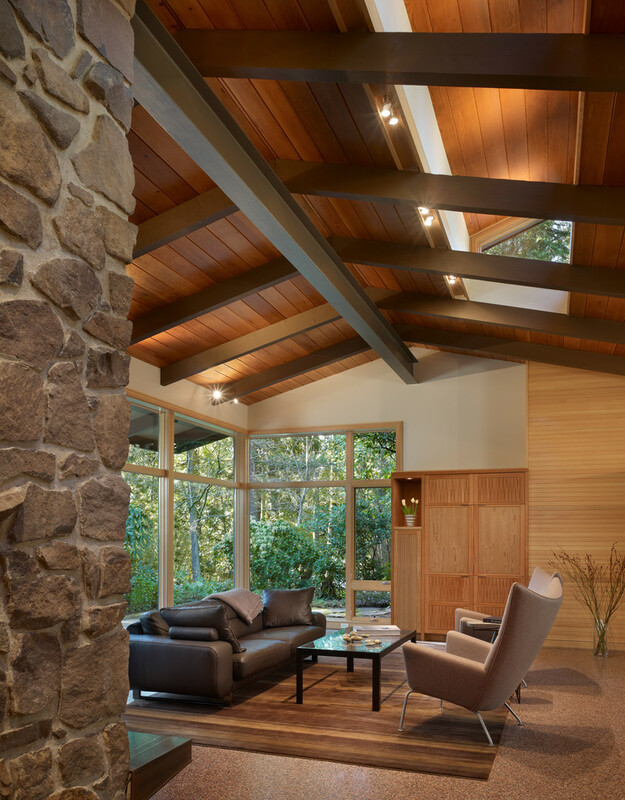 This one is a real example how wood materials fit an mid-century living room. The designer uses an open-concept living room because she/ he wants to expose the interior facades, especially the materials as well as to show fresh natural view outside through full-height glass windows. Raw rustic is deeply felt just by viewing this bedroom design. The whole interior facades use unfinished timbers and dark-finished woods as the main materials. 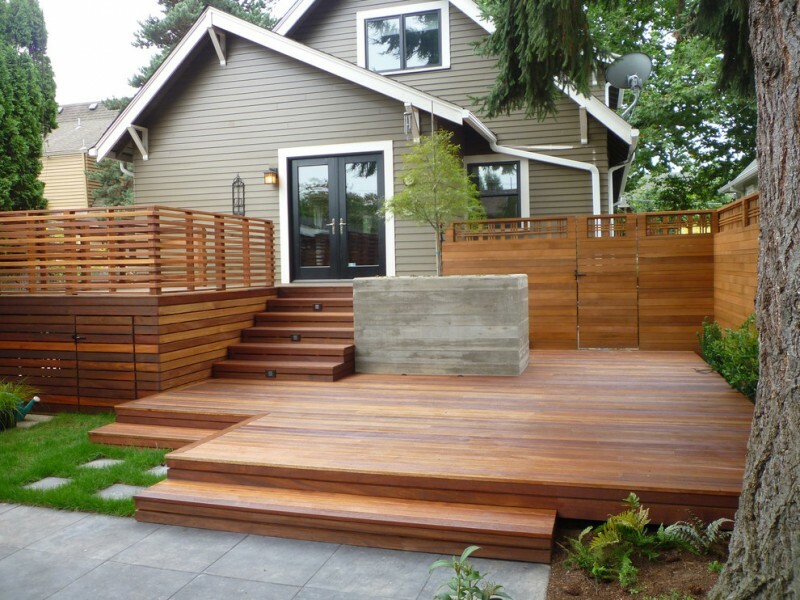 We’ll discover that unfinished timbers are installed to construct strong and warm wall systems, while dark-toned wooden floors are covered to create comfy and warm flooring areas. 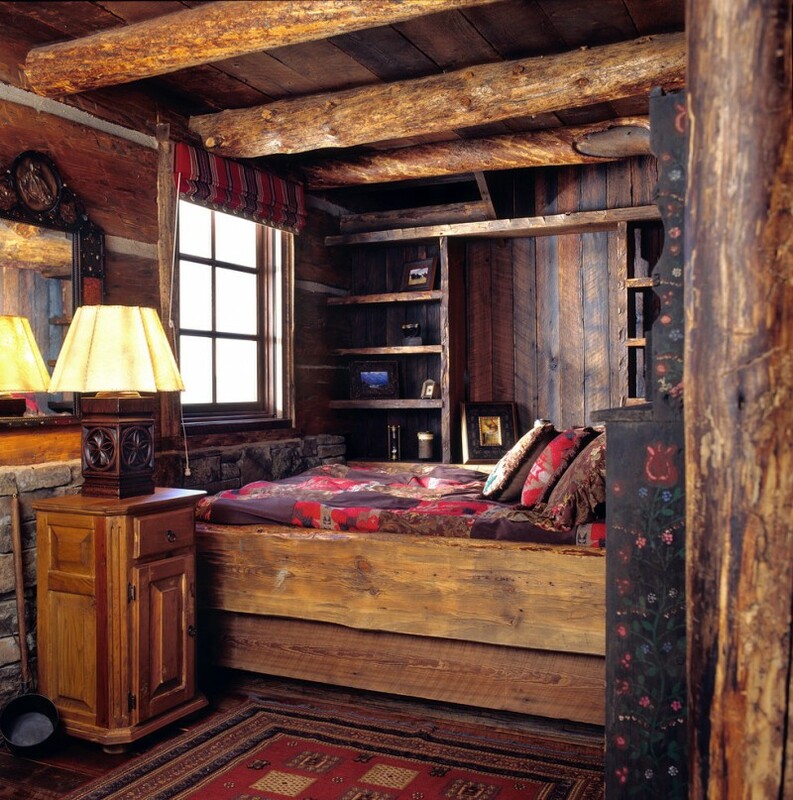 Rustic atmosphere is much more powerful after the bedroom’s furniture are laid into. Why? 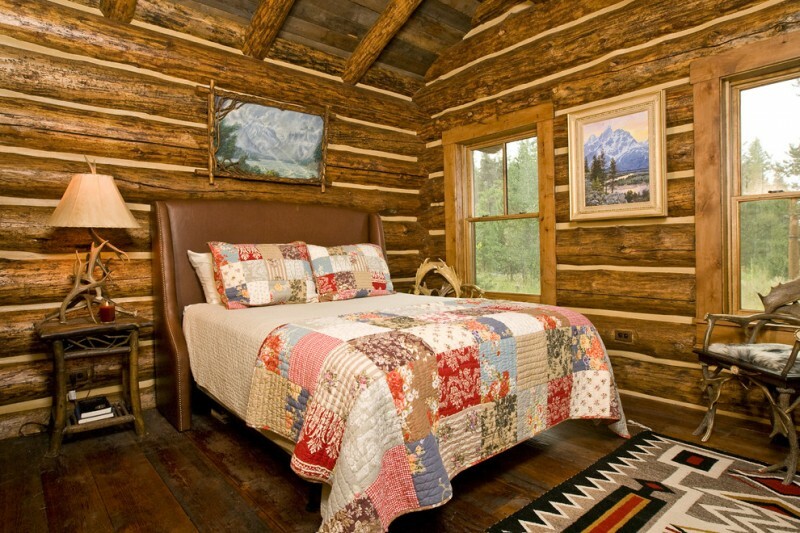 All bedroom’s furniture are designed in rustic style. Based on the photo, the interior facades are full of logs. They are arranged into artistic and exotic walls and roofs. 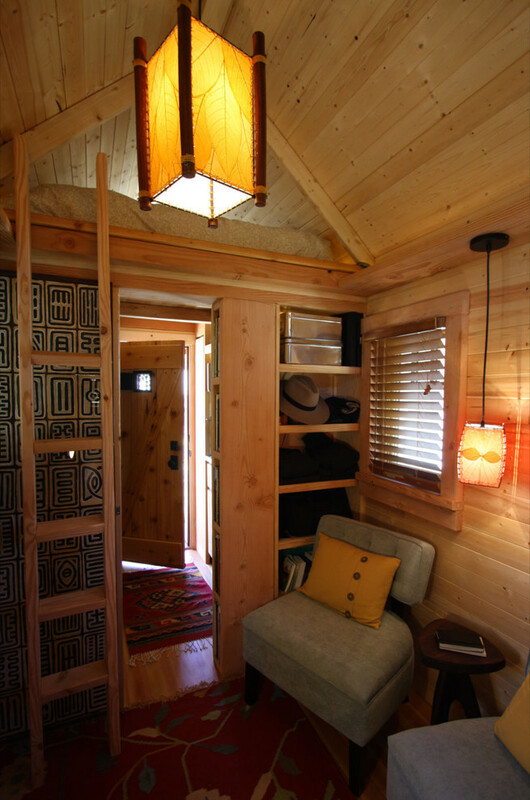 The interior part is supported by low lighting to empower warm and cozy warm rustic look. To make it little bit modern, the owner puts white bed linen and beige blankets on bed. Several pillows are also set to add comfort and beauty values. The final, a couple bedside tables and table lamps add another rustic appeal for bed. 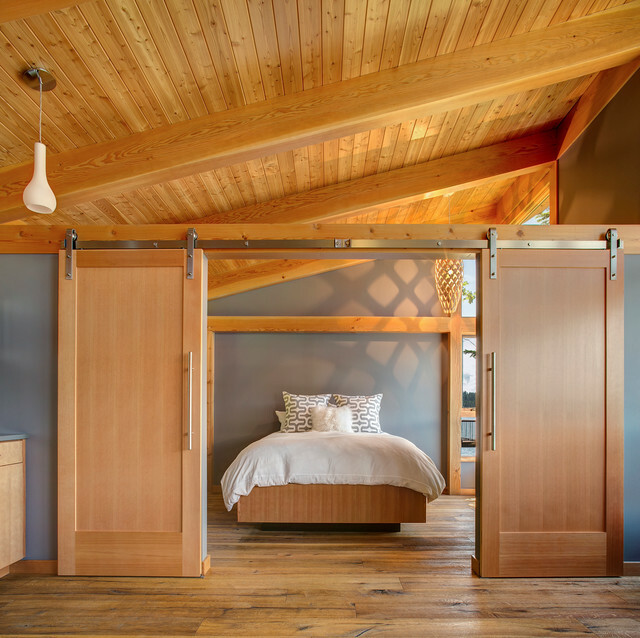 The designer combines yellowstones and woods to build the house facades, including this bedroom. It’s obvious that the interior uses big wood slabs and yellowstones arrangements on walls, and logs are installed for roofs. Like the other bedroom decorations, this one has been completed with bedroom rustic bedroom sets. It’s a pleasure to make our kids happy and full of adventure by providing them a tree house or wood house like this one. 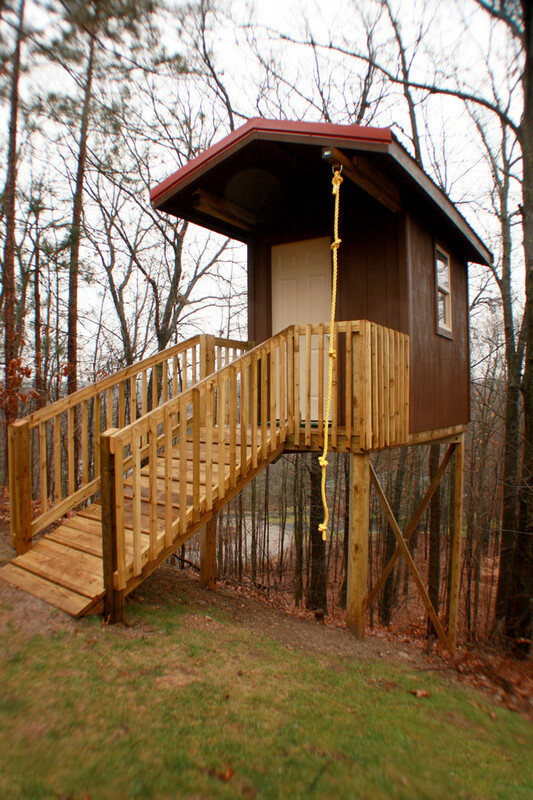 This wood house has a swing rope to climb up or climb down when needed. 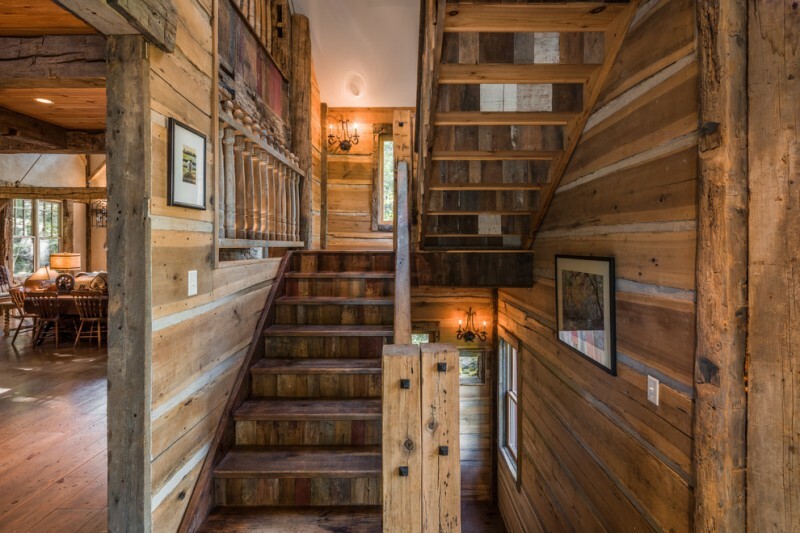 The house is also facilitated with wooden stairs. It’s simple but so stunning. A front door with a door knock made of metal look so perfect after being paired off with a couple of cool shabby wall lamps plus a decorative wheel. 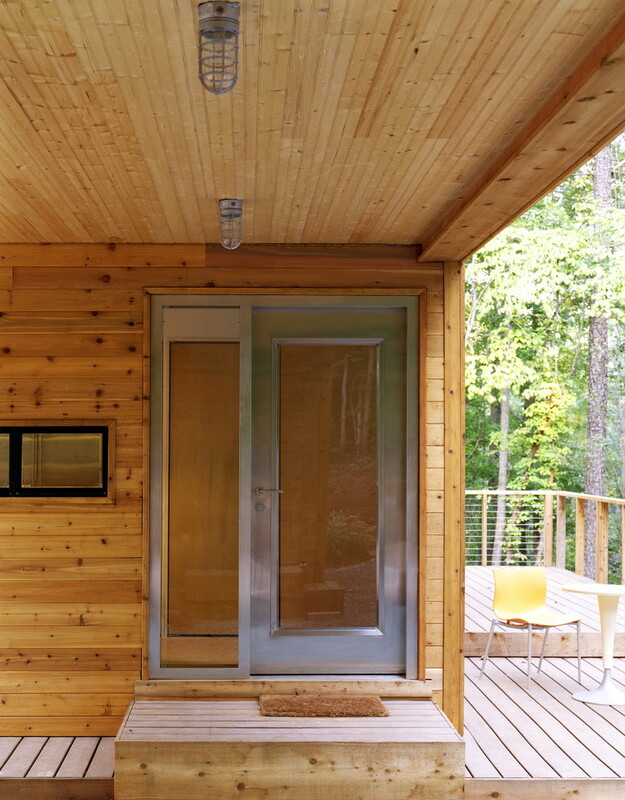 Both door and walls are built from native woods. It must be amazing to enjoy summer days here with family. 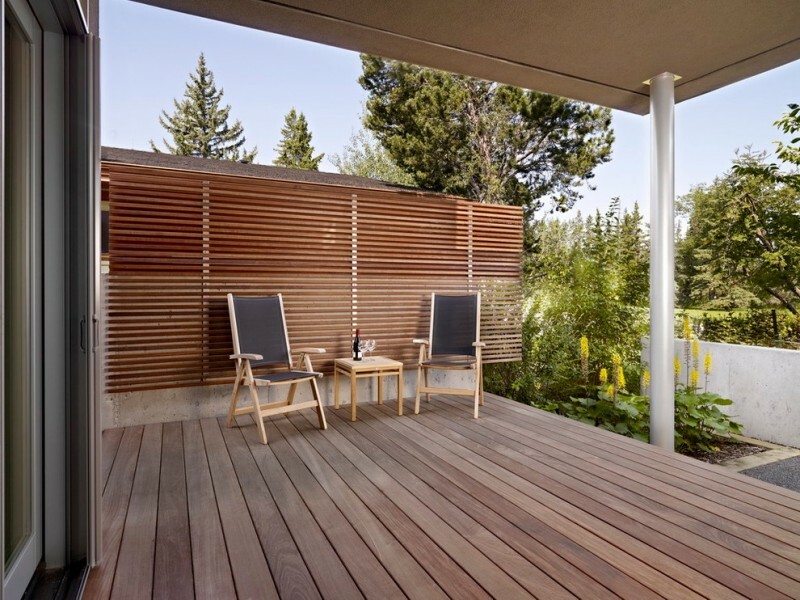 The back porch is designed in larger space, so it can be used for many purposes, like kids’ playground, BBQ party, garden party, or just a spot of gathering & making conversation with neighbors. 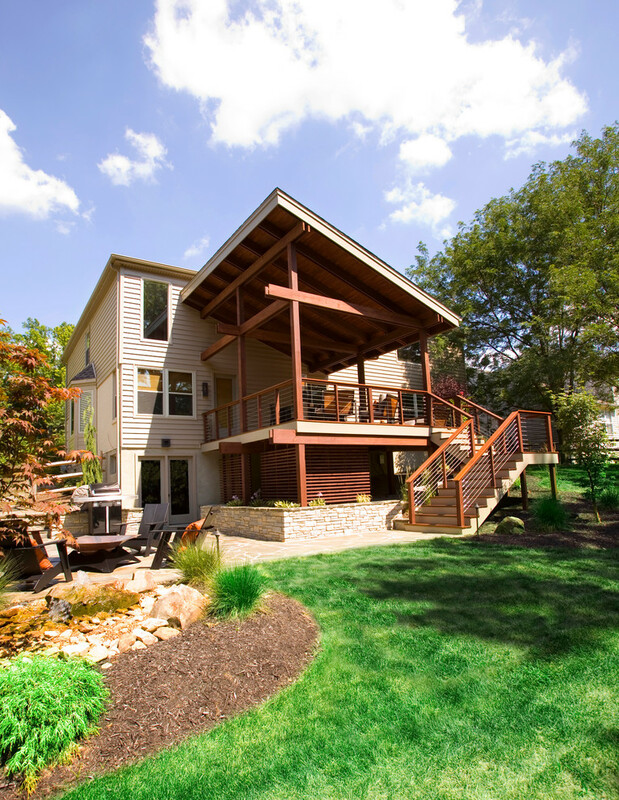 Both deck and porch are constructed from best local woods. White-stained metal furniture (sofa and table) brings a modern touch in this backyard patio. This furniture seems so striking over the other wooden-made properties. There are three different wood-colors here: dark, medium, and old & shabby tones. They have been applied precisely in this patio. Even, they suit with brownies-grey pillows and mattress. 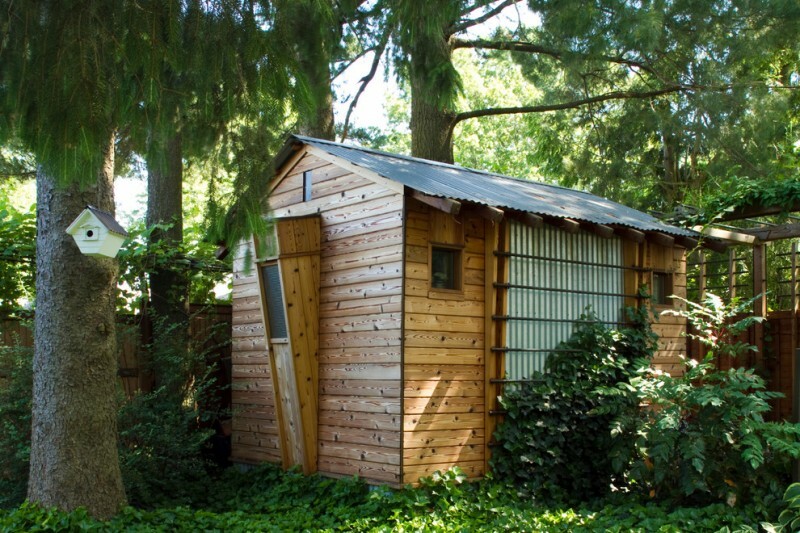 This gardening shed uses two different materials to build it: white cedar and lightweight metals. 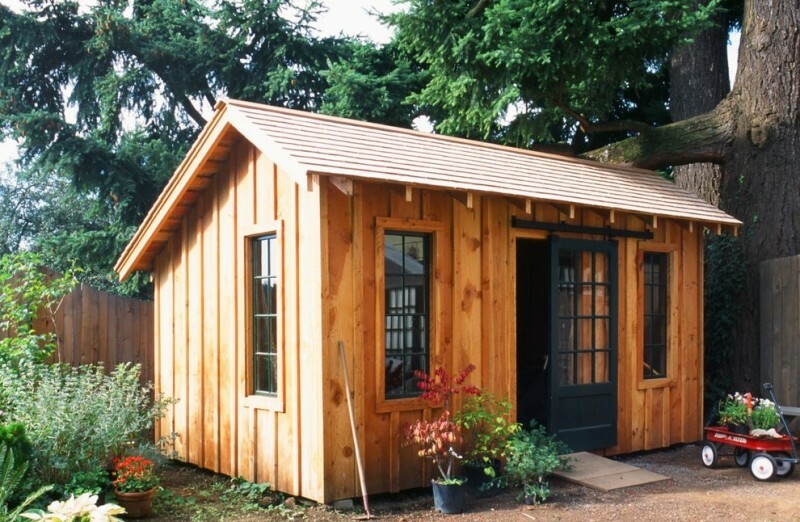 Cedar slabs are arranged to shed’s walls, and lightweight is used as the shed’s roofs. 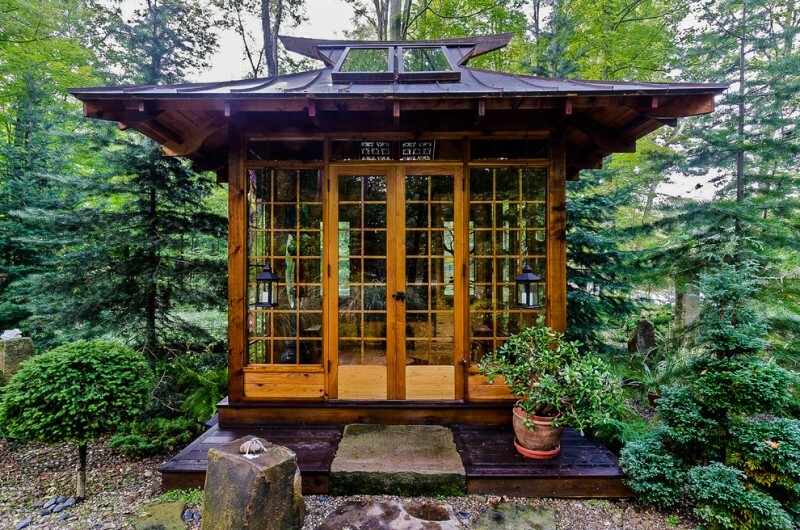 The shed has several glass windows in small size; providing sufficient natural lights for shed’s interior. 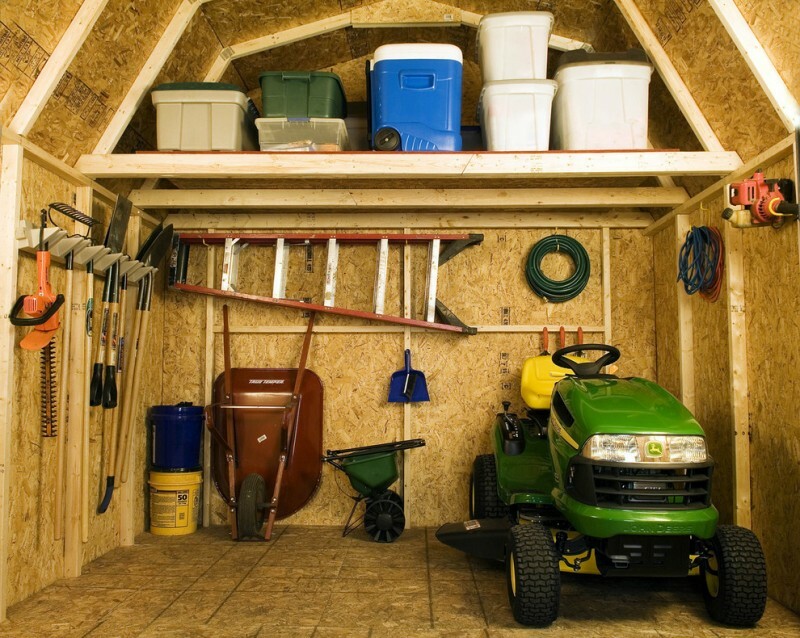 This 10×10 meter shed interior has been supported with upper shelf and hookers for storing gardening tools. 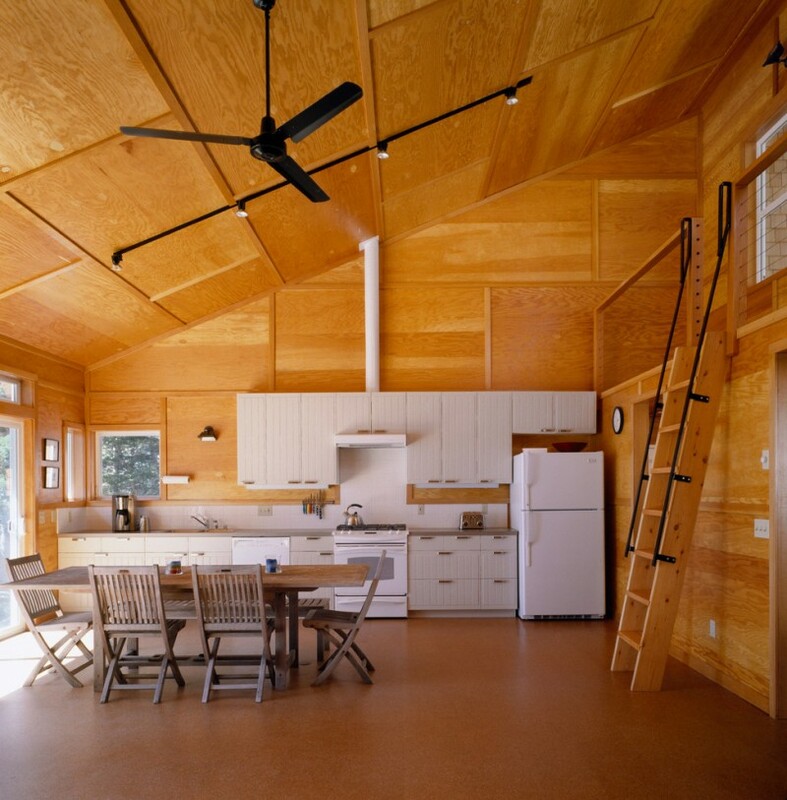 The whole interior is made of cedar grained with plywood. 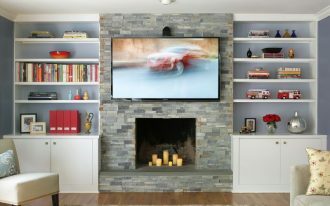 If you plan to build a cozy family room with hallway addition, this one may attract your heart. 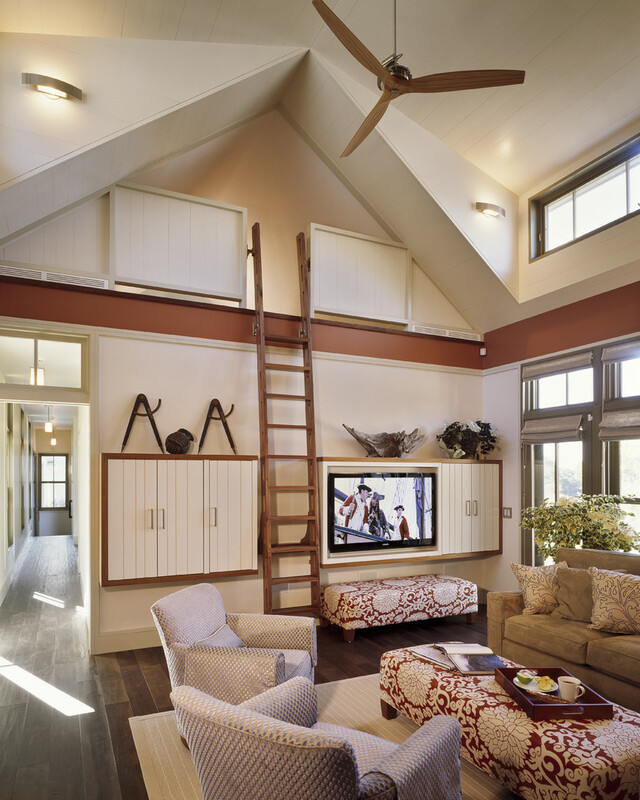 This room has unique concept; a pair of floating cabinet separated by decorative loft ladder. One of cabinets is used to conceal a TV set. This house offers so many amazing spots to enjoy. One of them is the house deck located in one of house’s sides. We can take a seat and make fun conversation there while fishing or just enjoying the lake’s beauty. This is a dining room with unique concept. A set of wooden dining furniture has been added with a big log for seat. 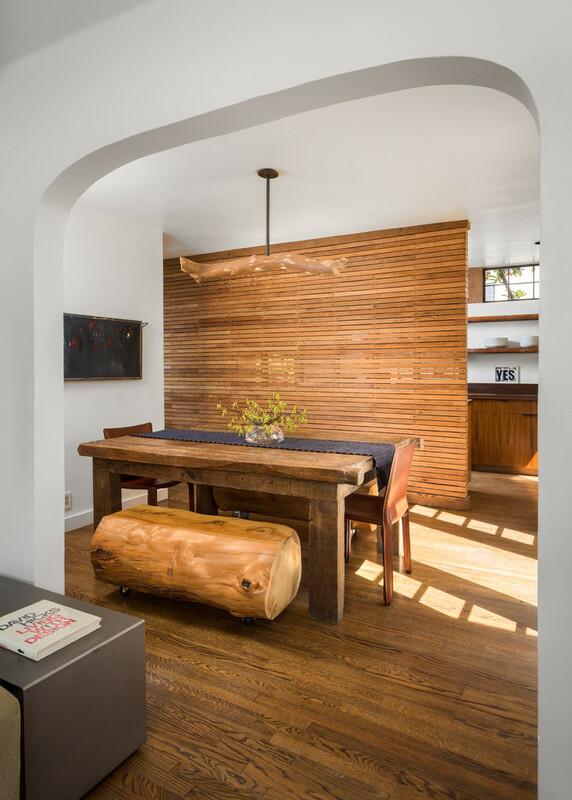 The room is also separated by a piece of bamboos partition that divides a room into two different spaces: kitchen and dining room. It’s wonderful to see such design. This small cottage has multicolor exterior. The designer uses several striking tones like white (windows’ frame), navy blue (door’s frame), and grey (cottage’s walls). 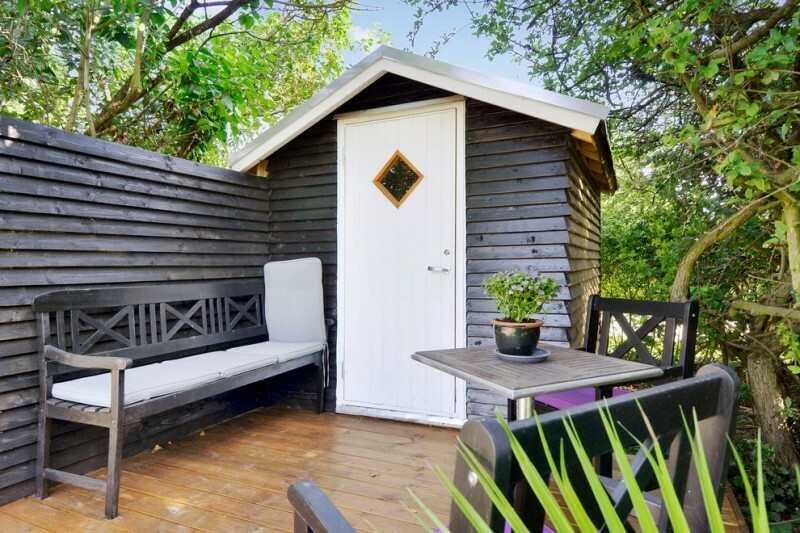 This cottage is flexibly used for another purpose like a shed. 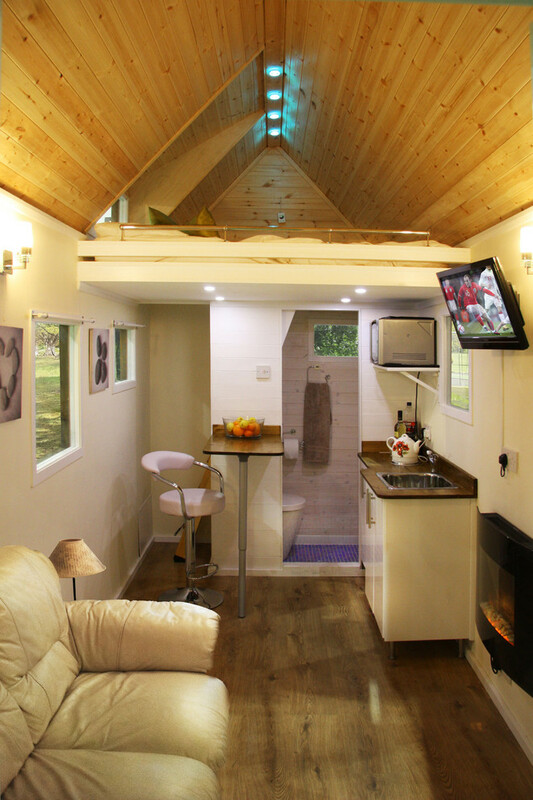 Small but cozy; the cabin can be equipped with a set of bedroom’s furniture like bed and wooden side table in small size. 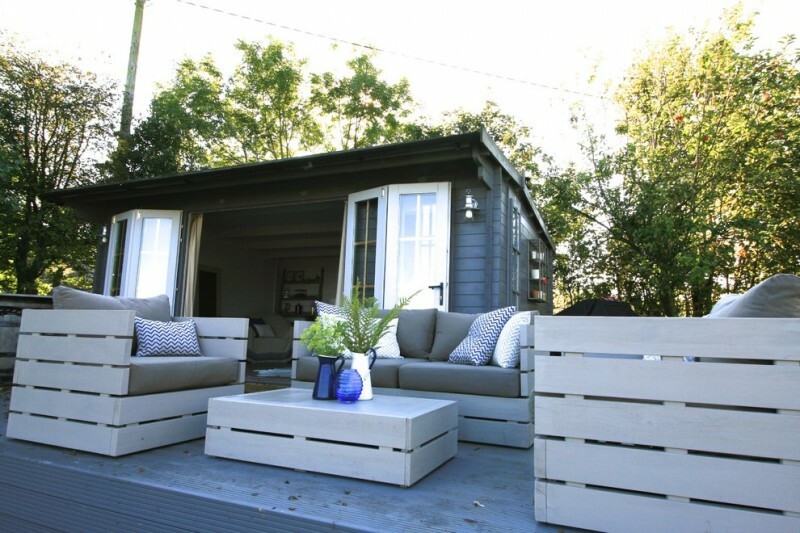 This summer house is inspired from Nordic style. The house can be customized into a guess house. To provide additional seating, we can put a set of exterior furniture. It’s always interesting to build a porch in a grey cabin house. 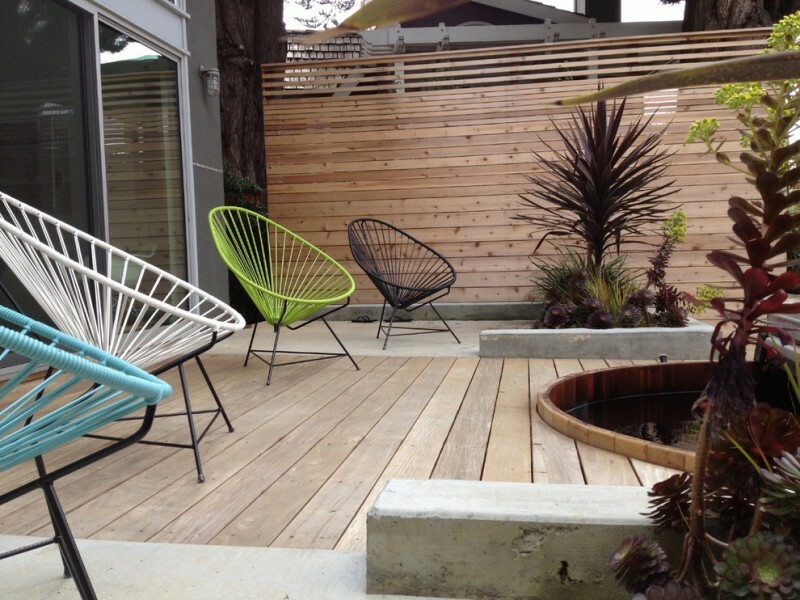 Add the porch with black exterior furniture like bench, a pair of chairs and center table. Insert white seating comforts into bench, providing much of comfort for everyone coming in. 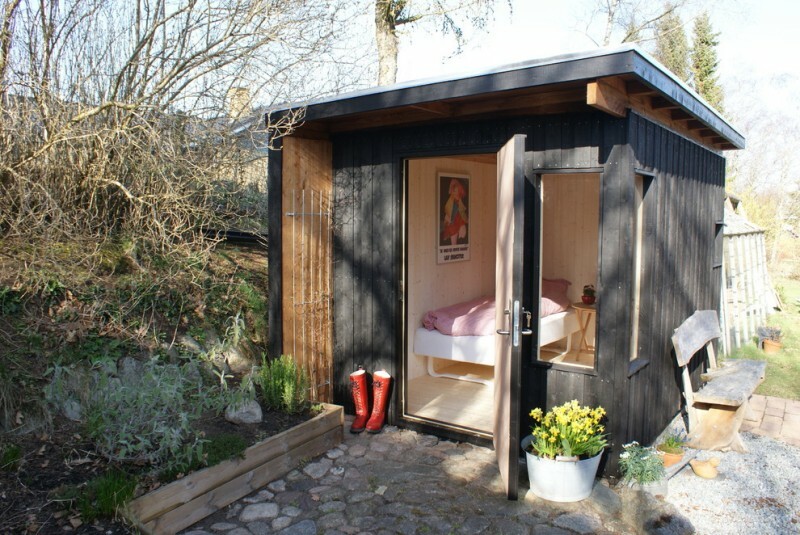 Soft black shed looks so stunning with blue-framed glass windows. The construction applies traditional exterior finishing to contrast the surroundings. 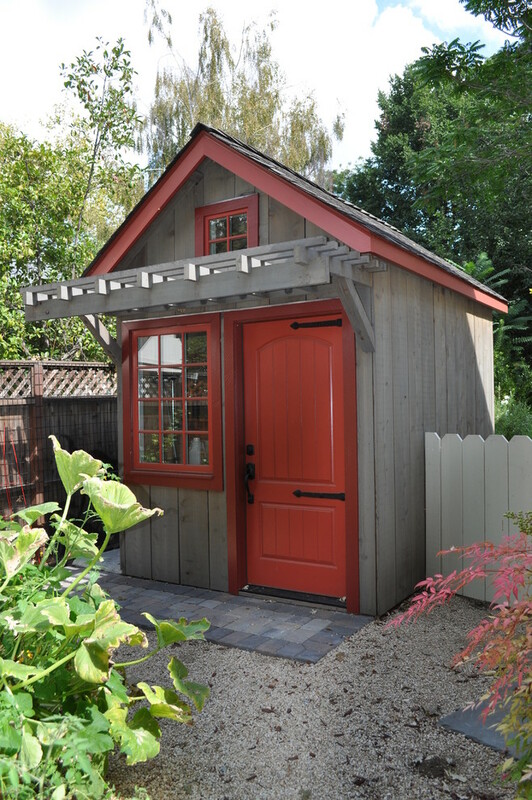 Create a stunning shed by collaborating red and grey as the building’s finishes. Red covers some exterior parts like the door’s panel, window’s frames, and vaulted roof’s detail. Grey is perfect to finish other exterior parts. 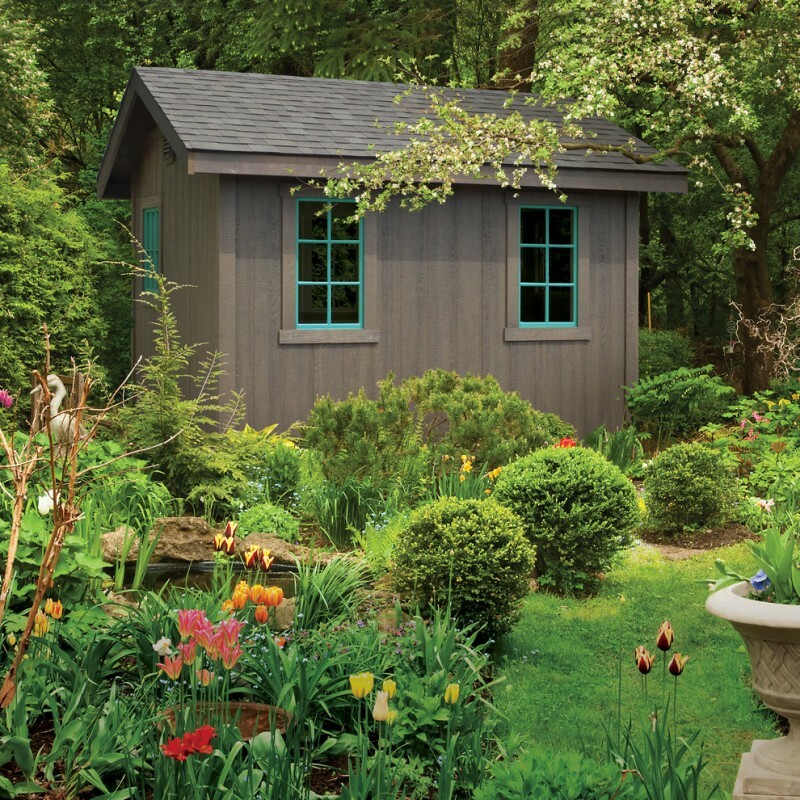 This is actually a gardening shed but it can be re-modeled into other buildings like a guess house. This building has been equipped with cedar roofs and rough trim and siding. 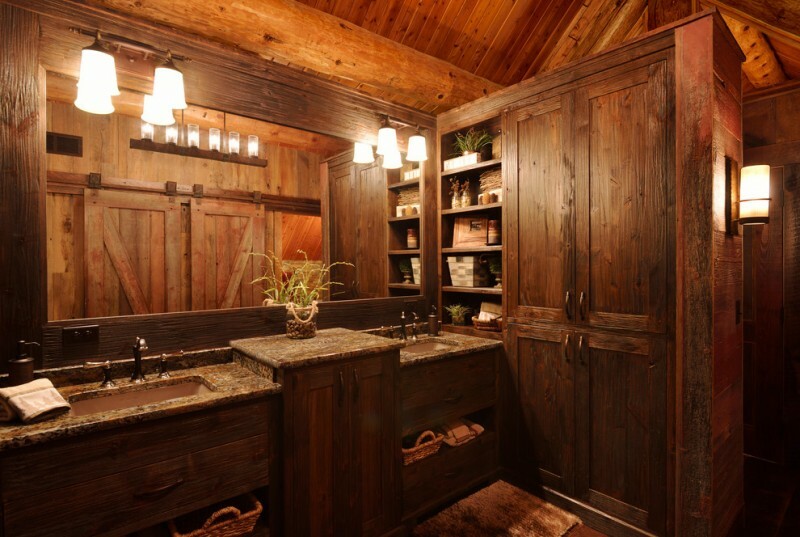 Logs and andesite can be collaborated into an artistic and rustic bathroom. 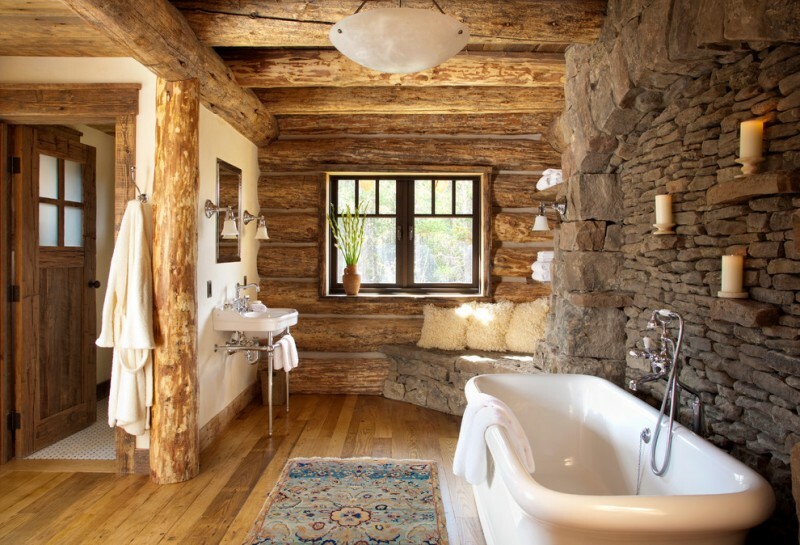 Like this design; both logs and andesite are combined to build bathroom’s walls. This powder is adapted from a popular lake house. All interior components are in rustic style. A small bathroom vanity with single copper sink and black faucet. 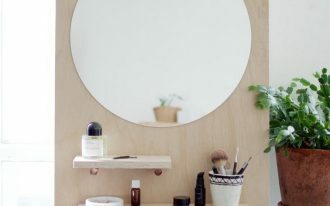 To accommodate storage space, the designer creates the concealed storage behind the vanity mirror.